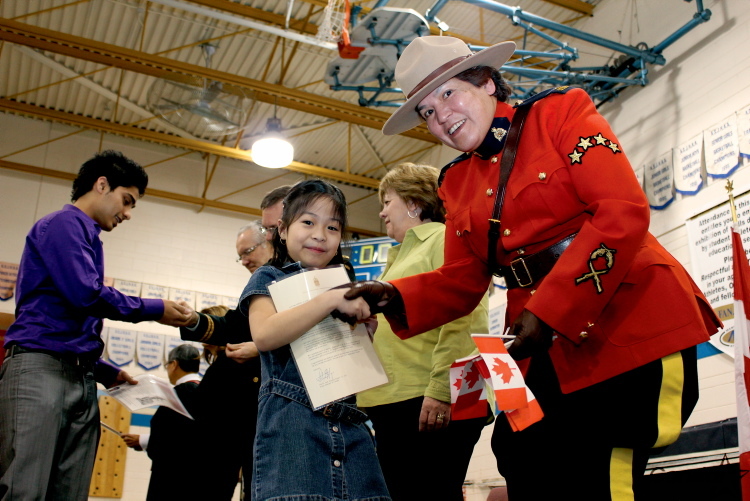 Angelica Detablan, 7, is handed her citizenship certificate and a Canadian flag by RCMP Const. Gerri Beardy at a ceremony at Charleswood School in Winnipeg, Manitoba. In June of 2015, it is expected that a few new rules and regulations will be implemented into the Canadian Citizenship Rules and the processing of applications. Majority of changes have received negative feedback from immigrants and several civil rights organization which accuse the government of creating a two-tier citizenship system. 4 out of 6 years and must show that you were physically present in Canada for at least 183 days per year for each of those four years. Any time spent in Canada before becoming a Permanent Resident could be used towards residency. No time before becoming a Permanent Resident can be used towards calculating your days in Canada for citizenship. Applicants must now declare their intent to reside in Canada during the application and indicate that they plan to make Canada their permanent home. Not required to file taxes. On top of the above, a few more changes that we should be expecting are stricter offences and penalties for fraud and misrepresentations and new grounds and process for revoking citizenship. It is highly recommended that anyone who is eligible for citizenship now to apply before the rules are implemented. the same old rules . I am happy to stumble upon your site. I qualified for Federal Skilled Worker through Express Entry but I don’t have a job offer yet. Will I still get Invitation To Apply? over 1.5 million unemployed, 4-10 have given up search.